Watermelon is an excellent fruit for making infused waters as it releases flavor quickly and is very refreshing. The cilantro adds just a hint of herbal flavor. Delish! 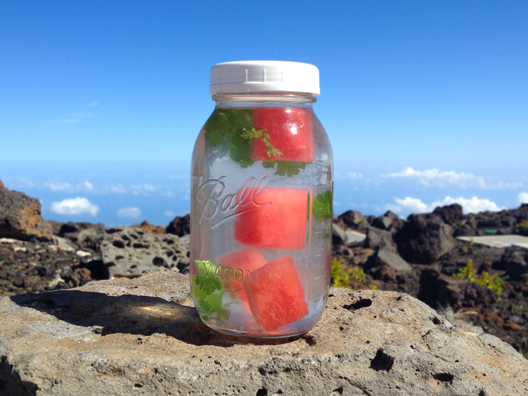 Recipe for a 32-ounce Ball jar (with a plastic lid): 4 cubes fresh watermelon + 5-6 leaves cilantro. Tear the cilantro leaves in half to get the most flavor. Add purified water and chill in the fridge for 2-4 hours. 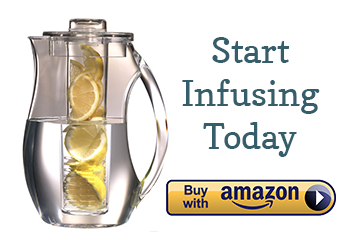 Note: do not re-infuse this water or leave to sit too long as the water will become cloudy. P.S. I had an amazing opportunity to visit Maui for a few days this week. These photos were taken from the top of Mt. 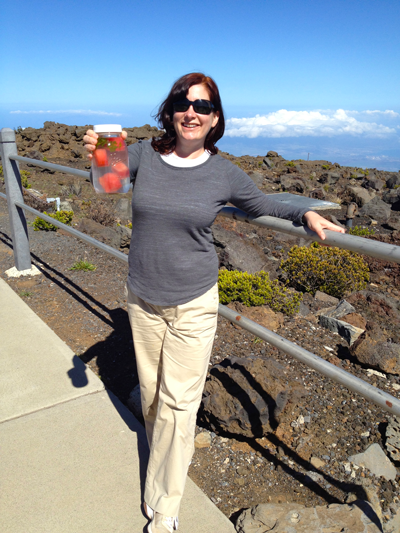 Haleakala where I proudly hiked with my infused water. How wonderful that you were able to visit Maui. I’ve been fortunate enough to have gone twice in my life and took the bik ride down Mt. Haleakala both visits. It’s just wondeful. Thank you for sharing the great pictures! Hi ! Just a question ! It’ll be a favour if you reply ! Ere’s my question ! Isn’t it said that cucumber/melons/watermelon should not be consumed with water ? Is it safe to infuse water with these then ?